Y’all know how much I love homeschooling! 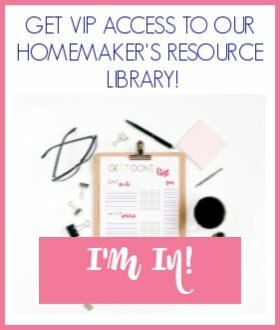 Last week I shared our homeschool curriculum for the 2016-17 school year. 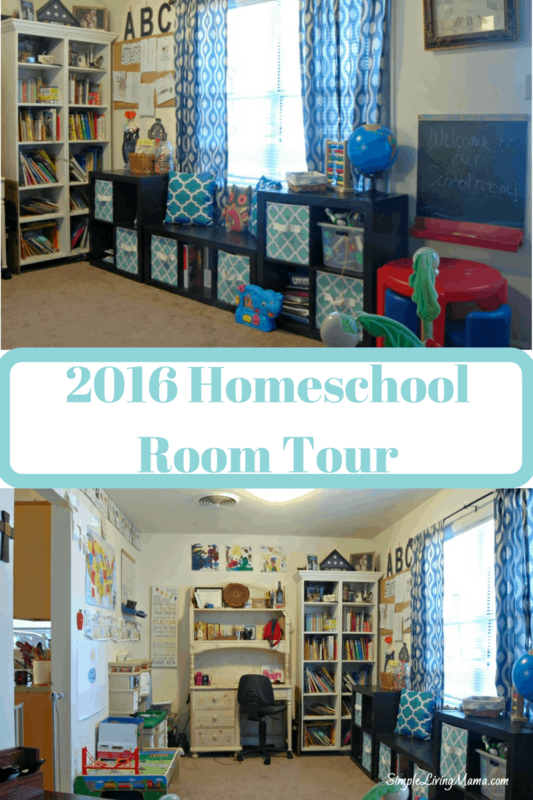 This week I’m sharing a tour of our homeschool room. I’m late getting this post up because I thought I wanted to take pictures when the room looked “perfect.” You know, I wanted everything to be in its place and for it to just look amazing. I quickly realized if I waited for it to be “perfect” I would never get to photograph it! 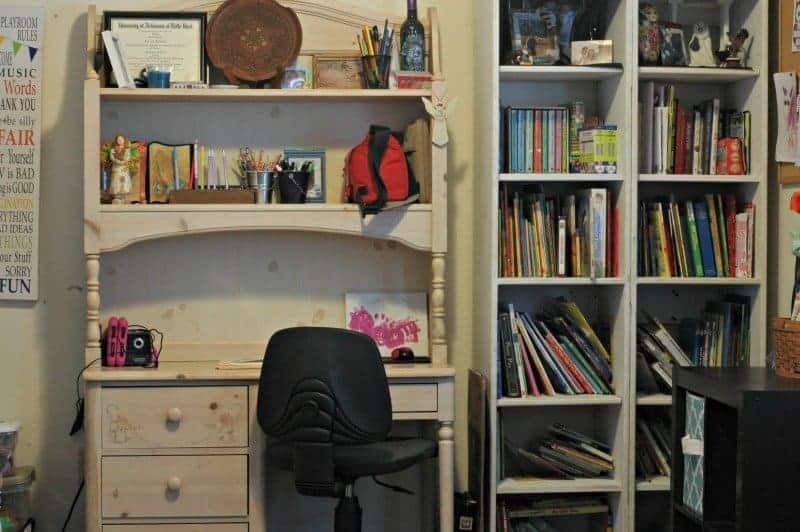 I have five kids and someone’s always pulling something off the shelves and my books don’t stay organized for more than a few minutes. 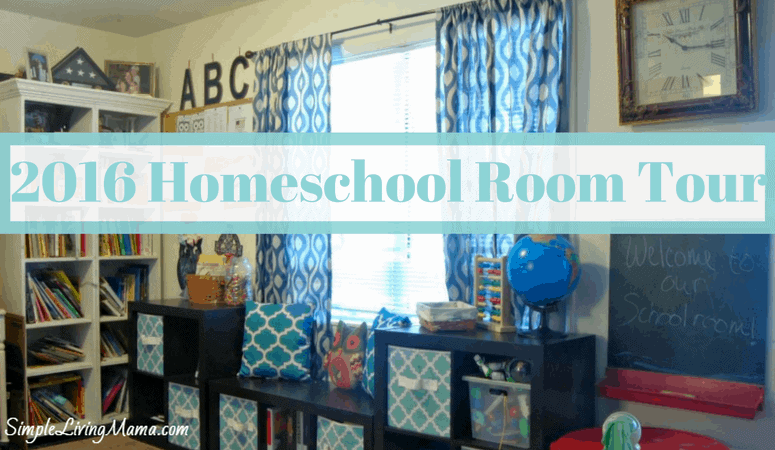 So, without further ado, here’s our little homeschool room! The first picture down below is the view looking straight into the room. This room was originally labeled the dining room. It adjoins the living room. I decided to make it our school room because it has carpet, and kids, food, and carpet don’t mix. We use a smaller space that adjoins our kitchen for dining. The left wall of the house holds our chalk board, which came from a Melissa and Doug easel that my kids destroyed. Underneath is a Little Tykes table for my toddler and preschooler. I love my cube book shelves. They are the Better Homes and Gardens brand from Walmart. I bought a set, and use one bookshelf as a window seat. I still need to make a cushion for it. The cubes hold the majority of our school supplies. Each child gets one empty cube to use as a cubby. They also each get a bin that holds their school supplies. I also have one bin for math manipulatives, one bin for current curriculum, one bin for baby toys, and one bin for preschool products. 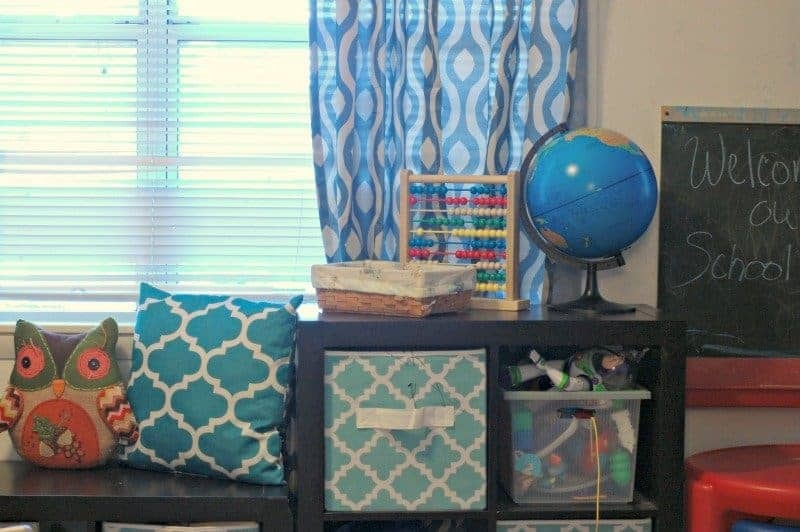 On top of one shelf is our globe, abacus, and nature basket. 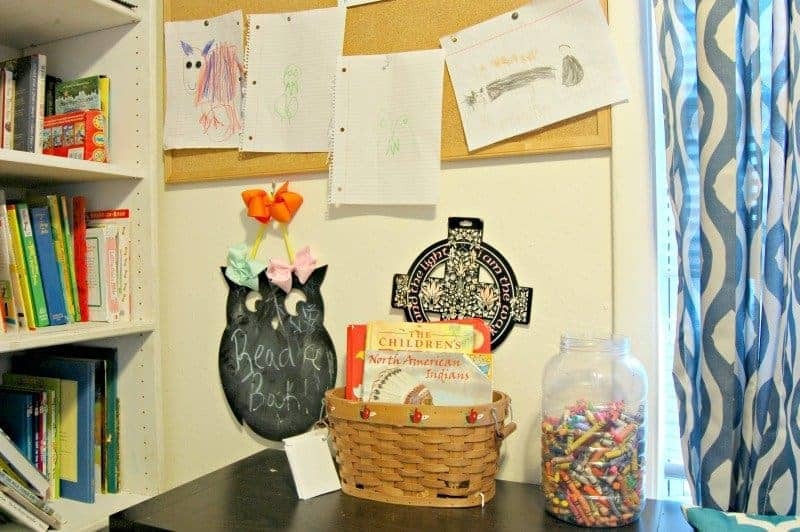 The other shelf holds our morning basket, crayons, and our owl chalkboard. She encourages us to read! The bulletin board has the kids’ art work, two reading reward charts, the books of the Bible, and the Pledge of Allegiance. We have two tall bookshelves that hold extra books. I try to keep it organized, but it usually ends up a mess! The desk coordinates with my daughter’s bedroom furniture. I am using it as a teacher desk. It needs a little decluttering, but I keep extra pencils, colored pencils, pens, and electronics on it. Extra school supplies are in the drawers. Here is the other side of the room. Above my desk are canvases the kids painted. 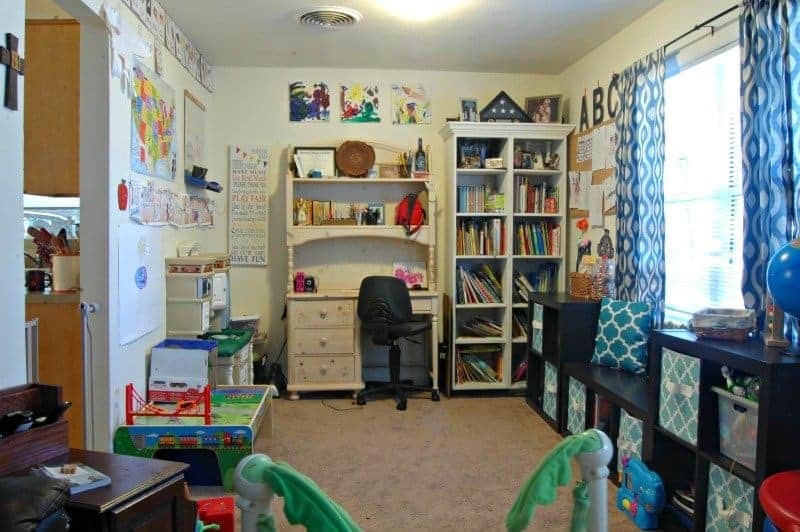 In the corner we have a box of play kitchen food and our crate that holds all of our student sheets for the year. 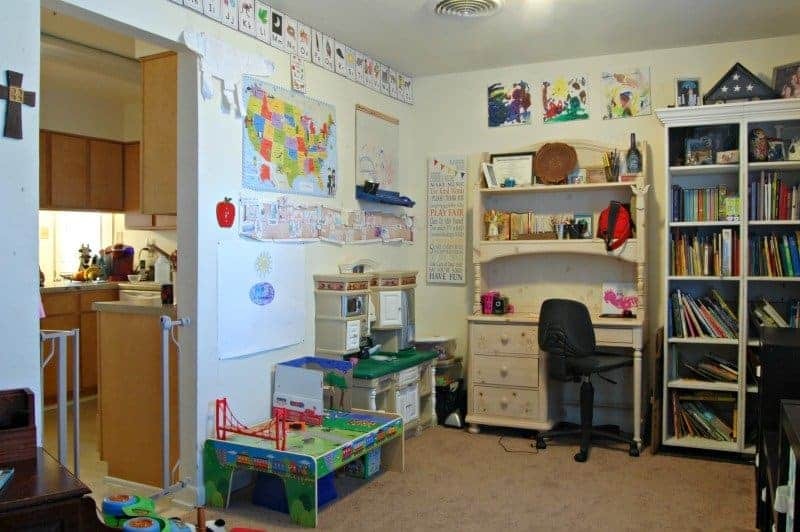 I also have the kids’ play kitchen and train table on this wall. Our ABC flashcards from My Father’s World are at the top of the wall. 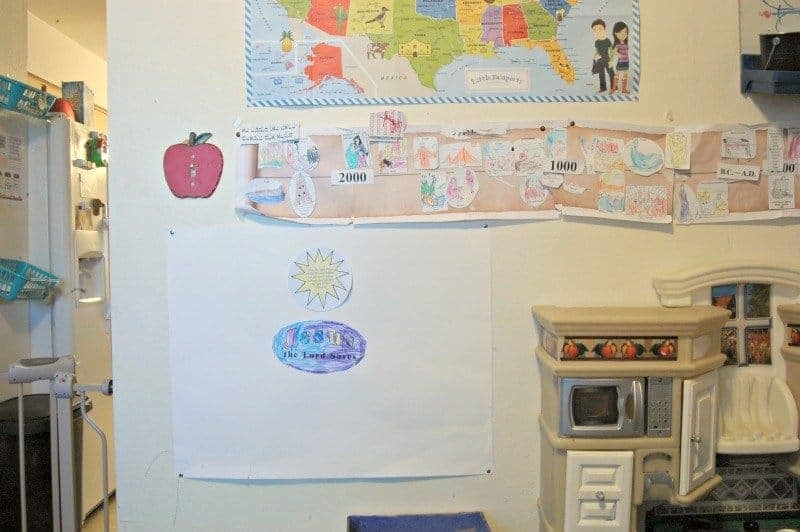 We have a map from Little Passports, the dry erase board from the deconstructed Melissa and Doug easel, and our timeline. Below the timeline is our Names of Jesus poster that goes along with My Father’s World Adventures. Here’s a closer look. I had to put the apple light switch cover in here, too! So, that’s really it. I know that was a quick overview. We keep games, art supplies, and unused curriculum in a closet in the hallway. The kids do table work at the dining room table. I really love our space this year! 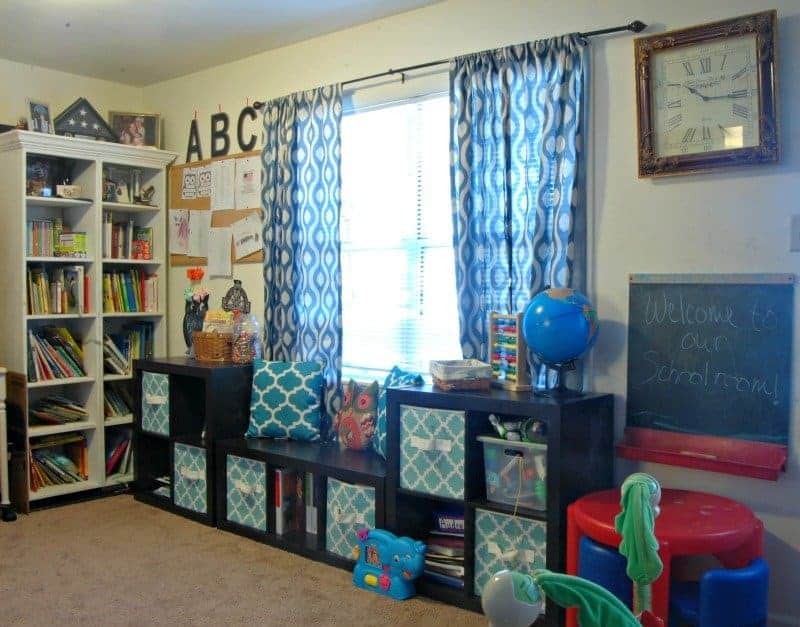 Your school room looks nice and functional. I like your window seat. 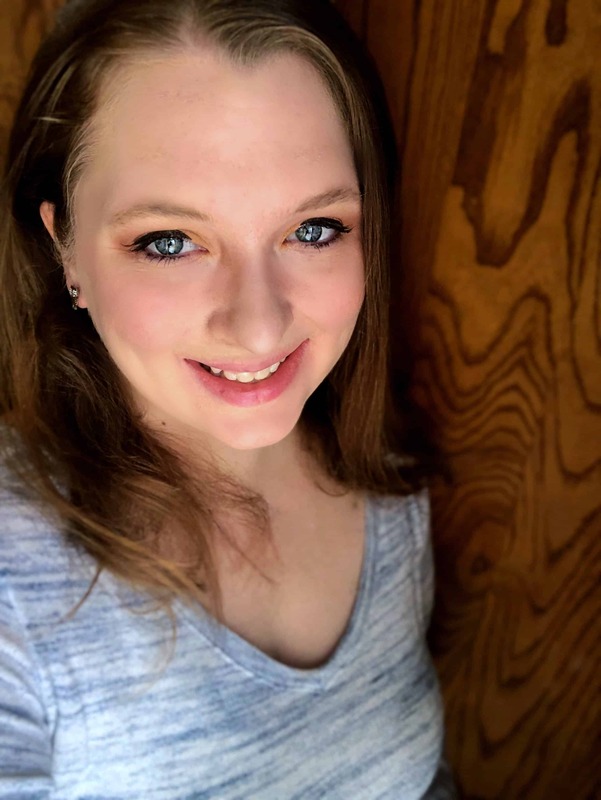 We have an upstairs gameroom that I tried to use as a schoolroom, but since much of our time focuses around the kitchen and I have many little ones we now do school at our dining table. It works, but we do have to try to stay on top of the school clutter or it overtakes our meals. I do have a large white board in the gameroom that if needed we have gone up to use for a small amount of teaching.